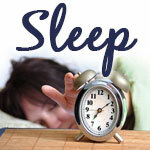 Sleep is an essential part of life and critical for good health. But for anyone with insomnia, a restful night's sleep is elusive. The occasional sleepless night is common, but insomnia is characterized as difficulty falling or staying asleep. People with insomnia usually experience fatigue, difficulty concentrating, mood disturbances, and decreased performance at work or school. There are two types of insomnia. According to the National Sleep Foundation, acute insomnia is brief and often happens because of what's going on in an individual's life. For example, when you can't fall asleep before an exam or after receiving bad news. Chronic insomnia, on the other hand, is disrupted sleep that occurs at least three nights a week and lasts at least three months. It can be caused by a variety of factors, including changes in the environment, unhealthy sleep habits, some medications, and certain clinical disorders like depression, chronic pain, arthritis, sleep apnea, and asthma. Insomnia is more common in women than men, but sleep quality often decreases as we age equally in both men and women. The long-term health implications of sleeplessness are still being explored, but research shows that poor sleep can affect immune function, memory, mood, and mental function. Insufficient sleep is also associated with diabetes, cardiovascular disease, obesity, and depression. There's no cure for insomnia, but you can improve sleep quality and duration naturally. Go to bed at the same time every night and rise at the same time every morning. Establish a consistent bedtime routine. Remove all TVs, computers, and gadgets from the bedroom. Studies show that electronic devices negatively affect sleep quality, especially in teens. Get plenty of exercise during the day. Research shows that people who are physically active sleep better than those who are sedentary. Exercise outdoors if possible to increase your exposure to bright, natural light. Avoid large meals late in the evening, and avoid stimulants like caffeine and limit alcohol. A variety of supplements can provide extra support. Melatonin is a hormone that regulates the wake/sleep cycle. According to a study published in the Journal of Sleep Research, melatonin may improve sleep quality and morning alertness in older adults with insomnia. Andrew Weil, MD, recommends taking 2.5 mg at bedtime as an occasional dose, and making sure the bedroom is completely dark. He recommends a much lower dose, 0.25 to 0.3 mg, for regular use. Valerian has been used for centuries as a sedative herb. It is commonly used to ease anxiety and improve sleep quality. Look for valerian in tea and supplement form, either individually or as part of a natural sleep formula, and take 30 minutes to an hour before bedtime. Chamomile has earned its reputation as a calming herb. Drink chamomile tea several times throughout the day to help calm the nervous system and promote restful sleep. When taken in tea form, chamomile is safe for children as well. Just be sure to avoid chamomile if you're allergic to ragweed. Finally, make a high-quality daily multivitamin part of your overall health regimen. It will contain calcium and magnesium, which have a calming effect; B vitamins to help relieve stress and promote a restful state; and vitamin C, which is also important for reducing stress and encouraging relaxation.